Bubbles are a source of fascination for children! When I was an Infant Room Teacher, I routinely introduced the magic of fun bubble activities for toddlers into our daily activities! As a mom, I loved seeing my children giggling with delight at the sight of those clear, shiny orbs dancing through the air. Bubbles are mesmerizing to babies and toddlers. Honestly, I still appreciate the fun that accompanies a fabulous bottle of the soapy potion; an ordinary liquid that transforms any activity into an adventure. True mom confession: My daughter is now a teenager who is learning to drive. I took her to the empty school parking lot one day last week and sat in the passenger side while she practiced driving. In the side door pocket there was a bottle of bubbles that my sister had given to us after a family visit. I took out the bottle, removed the wand, and held it out the window as my daughter drove. If someone had looked out their apartment window or driven by at that moment, they would have seen the trail of bubbles coming out of my side of the car. I watched them from the mirror as they floated away, dancing in the wind. 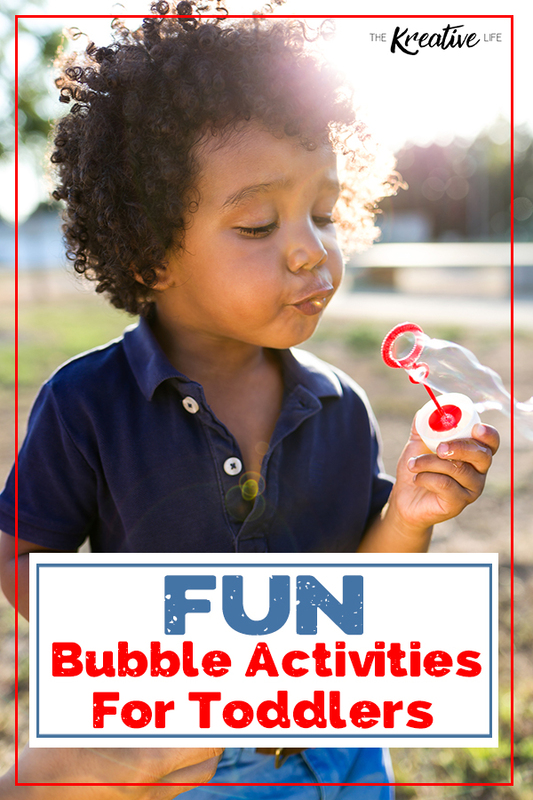 Ways to Incorporate Fun Bubble Activities for Toddlers Into Your Life. Bubbles can be incorporated into story time. Create a basket or box with assorted bubbles. Scented or flavored bubbles are fun variations. Practice sounds that are easy for babies and toddlers to copy as you read books with “bubble” themes. Bubbles are perfect to encourage reaching on “all planes” (in a variety of directions) and balancing while sitting, in a crawling position, and standing. Think about how your body moves when you have to catch bubbles that float away from mid-line, up/down, right/left, and crossing mid-line. Entice young walkers to move toward bubbles caught on the bubble wand. Make sure they are safely positioned, on a stable surface, and have a soft place to land if they are still working on their balance. Bubbles can be added to your music/movement and “circle time” activities. March to favorite tunes as you wave the bubble wand. Bubbles at home are fun in the bath tub and can be used with the “Bubble Song” I made up for my children. (I will share this with you today!) Note: I will also give you a variation of the “Bubble Song” that can be used in the classroom. You can also talk about directions like “up” and “down” as you demonstrate looking up to the bubbles and watching them fall down. Your facial expressions and movements as you read your bubble books and blow the bubbles will encourage babies and toddlers to imitate and repeat these actions. Bubbles are awesome when your child has an unexpected meltdown and needs a fun distraction. I have been known to keep a tiny bottle of bubbles (like the kind you receive as a wedding favor) in my purse or back pack. These little bottles can be taken out in the grocery store, in a restaurant, while waiting in line, at the doctor’s office to reduce stress, or on the road when the trip seems to take forever in toddler time. (Small bottles will need to be supervised to eliminate choking hazard. Those tiny caps need parental oversight.) Encourage popping the bubbles and if needed, sing the bubble song. A favorite memory is the time I took my 3 year old and 4 month old for a walk in the stroller. We packed snacks, a blanket, and a bottle of bubbles to go. I found a grassy hill that overlooked a road close to home. We spread out the blanket and all of us sat down to watch the cars going by, the clouds in the sky, and the birds on the fly. (Yes, I made that rhyme because I also love poetry.) The 4 month old had tummy time outside while my 3 year old practiced blowing bubbles for her baby brother. He rewarded her efforts with smiles and laughter. I was rewarded with a peaceful afternoon, a warm, sunny day, and an incredible memory of those moments with my babies. and we’re gonna get clean tonight! and we’re going to pop some more! Recommendation: World of Writer Mom encourages you to check with your child’s Developmental Pediatrician, Physical Therapist, or Occupational Therapist if your child has a medical or developmental diagnosis prior to doing activities #3, 4, and 5 so they can review positioning techniques. A Speech Therapist can offer additional activity ideas regarding activity #8. Wishing everyone a wonderful week filled with fun adventures, plenty of resources to tackle your goals, and the energy necessary to parent through summer! Mary is the mom of three plus several “BONUS” children. 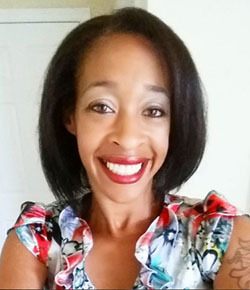 She is a writer, advocate, and manager of challenging life situations. 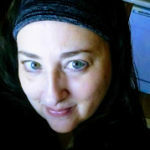 You are invited to read and share her adventures at World of Writer Mom. You can also check out Mary on Baby’s Books and Bubbles, Oh’ My! or follow her on Facebook, Twitter, Pinterest, Instagram, or Google+.